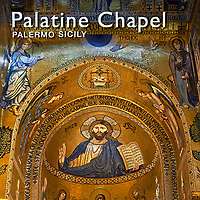 Photos, pictures of the Palatine Chapel, Palermo. The chapel was commissioned buy Roger II of Sicily in 1132 and was dedicated to St. Peter. The new chapel was built over an older chapel, now the crypt, that was built in 1080. The design of the chapel follows traditional Byzantine rules. At one end it has 3 apses which are semicircular recesses covered with semicircular domes. The central Aspe is higher than the 2 side apses and all 3 house the chapels altars. At the end of the apses the transept runs the width of the chapel. above the centre of the transept is a high dome. From the transept run a central naive which has 6 arabic pointed arches, 3 on each side, supported by older classical columns. On each side of the central naive are 2 smaller aisles. At the end of the central naive is a raised platform which is where the Frankish Carolingian throne was placed for the king to sit on. What makes the Palatine chapel one of Europe's great art treasures is its mosaic decorations. Every part of the interior of the chapel is covered with mosaics. The background color of the mosaics is gold which reflects the candles in such a way as to create a magic and mystical atmosphere that is almost overwhelming. Because the chapel is quite an intimate space the intricate flowing figures and patterns of the mosaic design crowd in on the senses and are almost overpowering. Each scene is surrounded by its own decorative border as can be seen in orthodox icon mosaics. 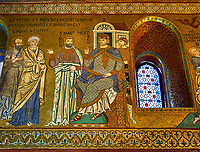 The oldest mosaics are probably in the transept and date from about 1140. These magnificently crafted mosaics depict the Acts of the Apostles. These mosaics almost certainly made by the finest Byzantine craftsmen probably from Constantinople. The style of the design is heavily influenced by orthodox iconography and the inscriptions are in Greek. The other mosaics depict scenes for the old testament and scenes from the lives of apostles and probably date from the 1160's. They are not as fine as the transept mosaics and were probably made by local craftsmen as a lot of the inscriptions are in Latin rather than Greek. 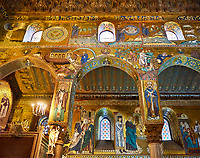 The Palatine chapel is a political statement from the 11th and 12th century. It is designed to appeal to Roman & Orthodox Christians, Jews and Muslims alike. Its mosaics depict biblical scenes as well as very rare secular mosaics and paintings on the ceiling depicting everyday life, animals and flowers. The Arabic style multifaceted ceiling, made from Nebrodi pine, is influenced by Iraqi Abbasid art. Lions & eagles are depicted and these paintings are the largest single Fatimid work of art of its day, seems to reflect the relaxed norms of a tolerant society. The scenes would have been frowned upon by Muslims of the time yet they would have been painted by Muslim artists. In the Palatine Chapel the Normans are sending out a secular message of tolerance to dogmatic Muslims?